I’m offering my first blog candy contest…see the details below! I’ll be honest: I’ve had the You’ve Got This stamp set since the last catalog was out and I finally used it for this challenge! I don’t know why it has taken me so long to use this fabulous floral, but I have to say that I thought of it immediately when I saw the sketch that Pam Staples created for this week! I LOVE the designer paper that I’ve used for this card. This is from the Floral Boutique Designer Paper Series. Every pattern is spectacular! It’s all Night of Navy and Whisper White. During the catalog launch event that Stampin’ Up! had, they told us that this paper was hand painted and turned into designer series paper directly from the artist’s canvas! How great is that? My favorite paper sets are always the ones that were hand painted by the artists. I’ve also used the coordinating Washi tape that was created for the Floral Boutique Suite of products. The stamp set and thinlets are beautiful as well. It’s too irresistible not to buy all the products in the entire suite! I coordinated the paper with the You’ve Got This stamp set. The So Saffron goes so beautifully with the Night of Navy that I couldn’t resist using it for the giant background stamp. I’ve used my marker splattering technique to add Cajun Craze splatter to the background. You can see the details of how to do that HERE! 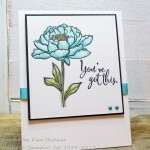 I stamped the flower in StazOn black ink and colored it in using my Aqua Painter and So Saffron, Pear Pizzazz and Cajun Craze. I cut it out along with the Night of Navy scalloped mat layer with my new Layering Ovals framelits. I wasn’t sure about whether to get those framelits since I already had a set of oval framelits, but WOW! you get a lot of framelits along with coordinating scalloped ovals all in the same package. It takes the guesswork out of trying to create oval layers! The scallops add a nice touch as well. The sentiment actually came from the Jars of Love stamp set. I was looking for something short and sweet that had a simple font. BOOM! Love that sentiment and this card will work for so many occasions! Can you see my gold metallic thread peeking out below the image layers and the one Night of Navy enamel dot? Little touches that don’t show up well in a photo, but add just the right extra touch for the person who is holding the card! Enter to win a Blog Candy Giveaway from Kim! I’m excited to offer Blog Candy this week! 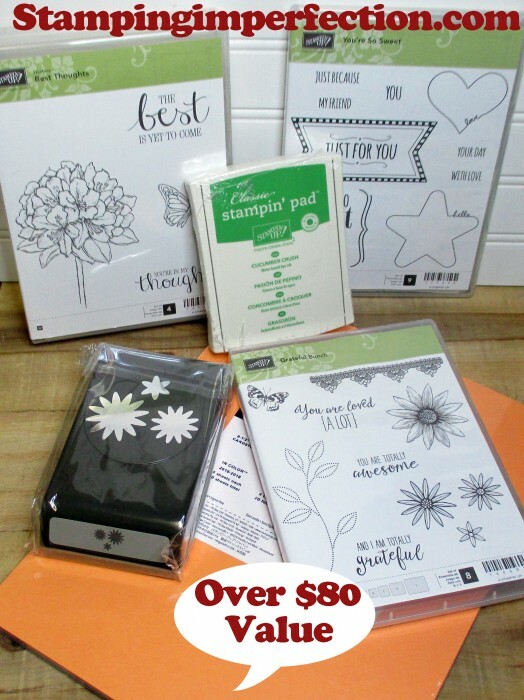 You could win a variety package of 2016-2017 In Colors, the Grateful Bunch stamp set and Blossom Bunch Punch Bundle, Best Thoughts and You’re So Sweet stamp sets and a Cucumber Crush Ink Pad to do some fun stamping projects! These are 3 of my favorite stamp sets!! It’s Easy to Enter to Win! 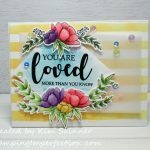 Leave a comment on this blog post (click the word Comments at the bottom of this post – and be sure you are on my blog, not reading this in your email), and tell me if you are currently working on any fun paper crafting projects, or if you are just getting started with stamping! Leave your comment before midnight on Sunday, 6/26/16. The winner will be announced on Wednesday, 6/29/16. Blog Candy prize shipped only within the US. Hello Kim- I’ve been away from stamping for a bit. Getting my workspace together to start creating. Really enjoy you on YouTube!! What a great prize! I’ve been stamping for many years-currently working on a Simon Says Stamp of the month kit. Great card and generous prize! Thanks for sharing your creative ideas with us. Great blog candy! Thanks for the opportunity! Since I am a teacher, my summers are the best time for my stamping and I try to get all my cards for the year stamped up now. I also make birthday cards for the students in my class, so I am working on those, too. Have to admit that I have not started those yet, but I will soon! I have to clean off my work table first… 🙂 Your card is beautiful. Those layering framelits are on my list. I like that washi tape, too! I just love this card you created for the challenge. The colors are just beautiful. I am taking some of your latest tips and doing some of my own creations. I want to try using my markers more. Love how you can use several colors on one stamp. Please keep your tutorials coming. You are sharing some great ideas. I love the stamped background, may just have to get that stamp! Lovely card. 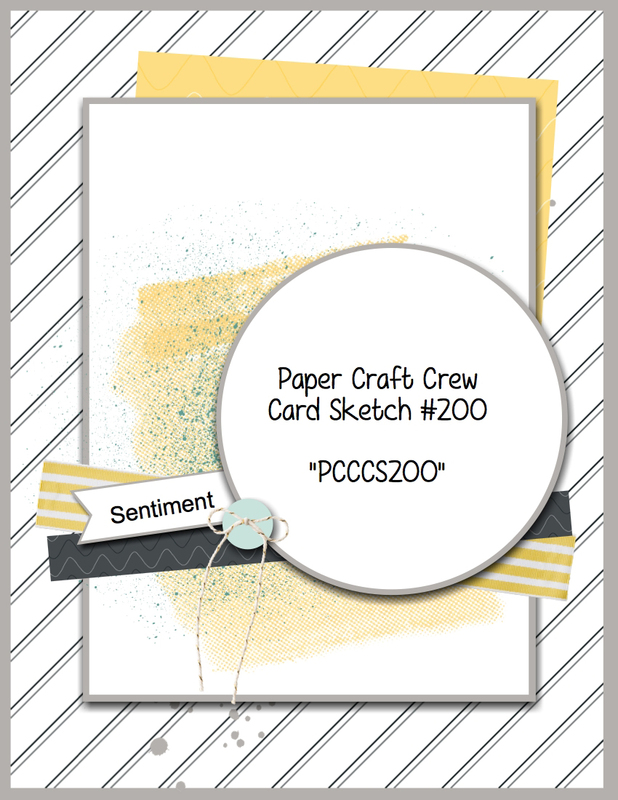 For crafting this summer, I am hoping, now that I have stocked up on some birthday cards, to actually get started on my Christmas cards early this year-instead of waiting until Thanksgiving and doing them all in a rush. Thanks for the great card ideas and videos! Hello Kim! I have been stamping for 20+ years and love being creative. I’m currently making lots of baby cards because I have 18 friends/family members that are having babies this year!! 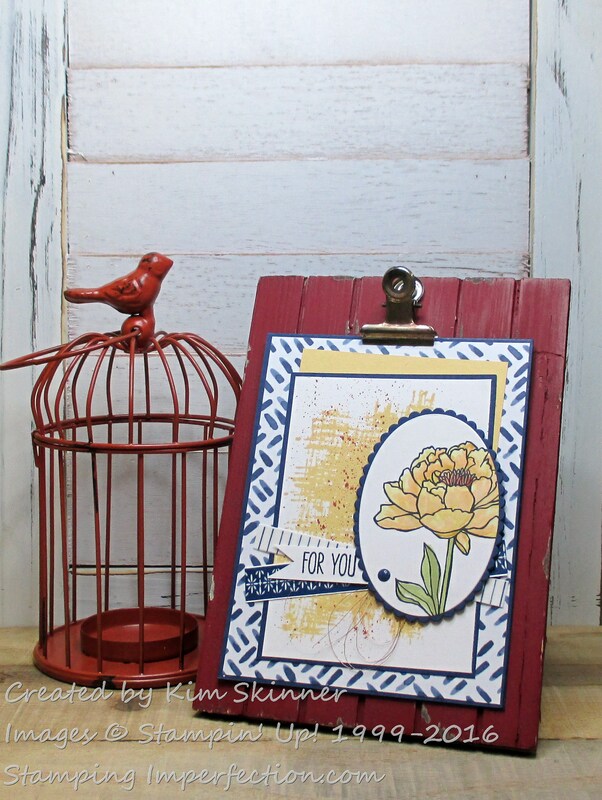 What a fabulous card for our 200th challenge celebration, Kim! I love your colour combination. Your display board is just darling, too! I love this card! I love the details from the thread to the enamel dot! I have been crafting for a long time, stamping for a couple of years, and am fairly new to Stampin’ Up. I use a hodge podge of crafting items from many different companies. Thanks for the inspiration!! I’ve been making cards for less than a year and keep finding new ideas to try. Currently, I am working on my granddaughter’s birthday card that involves stamping through a circular mask to create a pattern of circles and partial circles of flowers. There has been a little learning curve – but by George I think I’ve got it! This is such a nice card. The flower is pretty and I love the background layers! I am currently not working on a project but hoping to have time to work on this week’s sketch challenge. I can see a lot of potential with it. 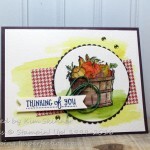 This is so cool and your card is so gorgeous – the details are so amazing!! Love that designer paper and your flower is blooming beautiful!! You are sharing such a generous gift – LOVE it!! I have been stamping since 1996 – I was a Stampin’ Up Demonstrator until about Summer of 2004. 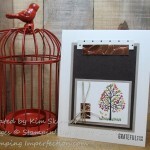 I love paper crafting and Stampin’ UP! remains one of my FAVORITE in the industry!! Sad I missed the blog candy chance, but I LOVE the card! I really like the layering ovals and I’m starting to think I need them too! Like the color combo too – just great!